The solar particles unleashed by last week's series of sun storms began barreling into Earth on Friday (Sept. 9), putting on quite a light show for some skywatchers in northern latitudes. The charged particles were sent streaking toward Earth by a chain of sun eruptions called coronal mass ejections (CMEs) from Monday through Wednesday of last week (Sept. 5-7). Our planet's magnetic field funneled the particles toward the poles, where they interacted with the upper atmosphere. According to the skywatching website Spaceweather.com, another potentially spectacular aurora display is possible tonight for high-latitude observers due to several intermittent geomagnetic storms at the Earth's poles. Dan Stanyer and his wife, Shauna, drove about an hour north of Prince George, British Columbia, Canada, to get a good look. And they were definitely glad they made the effort to seek out darker skies. 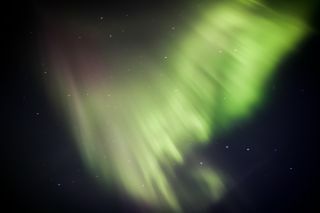 "As the darkness set, in we could see the auroras slowly getting brighter," Dan Stanyer told SPACE.com in an email. "There was a long green band across the sky, and we would have been perfectly happy having just seen that." "Around 10 p.m. Pacific time, the sky started to go crazy," Stanyer added. "The auroras were dancing across the entire sky. We didn't know which way to look. Definitely something we will not forget." After that spectacular display peaked, the Stanyers started driving back home. But the light display began picking up again, so the couple pulled over. Their tripod had broken, so Dan put his camera on the road to snap another photo. "Definitely an amazing night and overall experience," he said. In northern Alberta, the auroras also did not disappoint on Sept. 9. Skywatcher and photographer Don Arsenault and his wife Tammy drove from their home to some of their favorite northern lights viewing spots, including a serene-looking lake. At first the lights were dim and Arsenault was worried that the bright moon would wash out a promising auroral light show. He and his wife went so far as to start heading to a new observing spot when the northern lights over the lake lit up, so the skywatchers resumed their photo session. "As we did this, the words awesome, amazing and wow were used frequently. I recall looking straight up to see something that looked like it was out of a science fiction movie and it was difficult at times to concentrate on why we were there and not simply stand there in amazement," Aresnault told SPACE.com by email, adding that he went back out on Sept. 10 and 11 for more observing. "In the three years we have been doing this and the dozens of times we have been out, these lights were the best we had ever experienced." Another skywatcher in Canada, Colin Chatfield of Saskatoon, Saskatchewan, captured the light show from his own backyard. He would have preferred to find a darker spot, Chatfield said, but he didn't have time. The aurora "started out pretty brilliant but seemed to fade fast," Chatfield told SPACE.com in an email. Though he said he's seen more brilliant auroras than the one this weekend — particularly the spectacular light shows of August 2010 — Chatfield stressed that the northern lights are always worth checking out. Colin Chatfield captured this shot of the super-charged aurora on Sept. 9, 2011 from his backyard in Saskatoon, Saskatchewan, Canada. "I never try to miss an aurora show as they are always different and always fun to watch," Chatfield said. According to a Spaceweather.com report on Monday, the weekend's northern lights display was visible as far south as the northern United States, with observers in at least nine states from Washington to Maine reporting sightings. In Grand Forks, North Dakota, skywatcher Zach Williams was outside for an evening astrophotography session when he noticed something odd in the sky. "I noticed that to the north of me in the distance, was a very slight green haze. I had to do a double-take because it wasn't normal. So I set up a short exposure, and saw in my camera's viewfinder, that it was actually the Aurora Borealis!" Williams told SPACE.com. "I think the camera did a nice job in revealing more color then what I normally saw. This was something I've waited my whole life to see!" Williams photographed the aurora with the stars of the Big Dipper overhead. The super-charged aurora wasn't just visible to select Earthbound folks — the six astronauts aboard the International Space Station had a bird's-eye view. NASA astronaut Ron Garan took a spectacular photo, which shows a snaking green curve of light dancing between the blackness of space and a cloudy Earth sky. The aurora may serve as something of a send-off for Garan and his Russian colleagues Andrey Borisenko and Alexander Samokutyaev. The three spaceflyers are slated to leave the space station on Thursday (Sept. 15) to come back home. If they're powerful enough and aimed directly at Earth, CMEs can cause more than just beautiful light shows. They can wreak havoc, disrupting GPS signals, radio communications and power grids. However, last week's solar eruptions delivered mere glancing blows to our planet, so we were apparently spared any serious damage. SPACE.com managing editor Tariq Malik (@tariqjmalik) contributed to this report. You can follow senior writer Mike Wall on Twitter: @michaeldwall. Follow SPACE.com for the latest in space science and exploration news on Twitter @Spacedotcom and on Facebook.